A Drugstore Make up Starter Kit. When I started wearing make up I had no one to show me where to shop or what to wear. I grew up in South Africa where I wore little make up and when I went to year ten in England I felt so out of the loop about all things beauty. When I wrote my review about GHD I explained how they changed my life, literally made a big difference to my life. I wanted to share with you products that are budget friendly and easy to wear. I love drug store make up and I love trying out all brands, in my make up bag I use these on a daily basis. Mua: I love this brand and I use it myself, I have been using products from them for around two years now. This brand is sold online and in store at Superdrug. I love the quality of the products, they look great too. I think this is a great brand to use to bulk up your make up bag or even to create a starter kit. I buy my mom some of the Mua products and she adores them too. You can pick up single eye shadows for £1 and blushers for around £3. Large eye shadow palettes cost around £4, I have three of the palettes myself. Rimmel: Do I need to say anymore? Rimmel have been my go to brand for years. I started wearing make up when I was around 14 years old. Rimmel are reasonable priced and they have a huge range of products that you can trust. I love the Kate Moss lipsticks, they are incredible I have a huge collection of them myself. I love the quality, the packaging and everything about Rimmel. This brand has been the brand I trust for many many years now. You can buy so many lovely pieces for cheap but what you get is amazing. I love the Rimmel foundations, I always have one in my own make up bag. 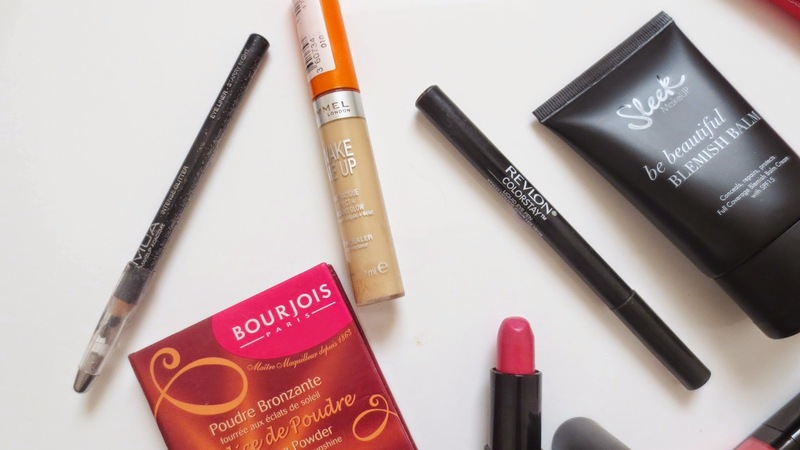 Bourjois: I love purchasing make up from Bourjois, I do find a few items a little pricey when I am on a budget. Saying this though you absolutely get what you pay for, the products are amazing. I love the Bourjois as they create such lovely products, I love the magic nail polish remover, this has changed the way I do my nails for sure. I am no longer lazy when it comes to removing all my nail polish. This brand is one to check out if you are starting to wear make up! Sleek: This brand is sold in Superdrug, you can buy so many cute products from them. I only have a couple products from them but both work wonders. 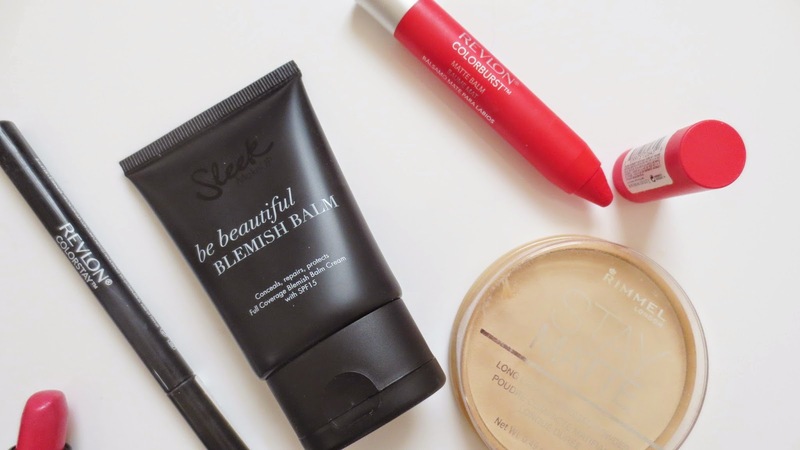 I am loving the Sleek blemish balm, it is light on the skin but it covers all that you want to hide from the world. I think this would be great to wear for school, its light and leaves the skin looking great. If you have lovely skin you don't need to pile lots of foundation on, you may regret this later on if you do. This is light enjoy to work with to create a subtle school make up look. Prices for Sleek are reasonable and they look great in your make up collection, whats not to love. Make up Revolution: my new found love this brand, I am loving everything they bring out. I am so happy with the prices of this brand, similar to Mua but I am totally converted to this stand in Superdrug. From day one of testing out this brand I knew it was going to be great, I have a brand focus post on this if you fancy a read. You can buy make up palettes from £6 and I can confirm they are incredible. The pigmentation in the eye shadows are insane, I love the packaging and look of all the products. They sell make up for your eyes, skin, lips and cheeks and adding in the extra of skin care. Nothing is left out with this brand, amazing products that you can fill your make up bag with for less than £30. Great post, lovely! I had no idea you grew up in SA! This is a really good starter kit! The Sleek BB cream is something I will surely be picking up, along with the revlon lip sticks! I'm a complete lover of the Bourjois Delice de Poudre!